A new Chandra movie of the Vela pulsar shows it may be "precessing," or wobbling as it spins. This movie contains 8 images from observations taken between June and September 2010. The Vela pulsar, found about 1,000 light years from Earth, formed when a massive star collapsed. The pulsar spins faster than a helicopter rotor and spews out a jet of particles at about 70% the speed of light. This movie from NASA's Chandra X-ray Observatory shows a fast moving jet of particles produced by a rapidly rotating neutron star , and may provide new insight into the nature of some of the densest matter in the universe. The star of this movie is the Vela pulsar, a neutron star that was formed when a massive star collapsed. The Vela pulsar is about 1,000 light years from Earth, spans about 12 miles in diameter, and makes over 11 complete rotations every second, faster than a helicopter rotor. As the pulsar whips around, it spews out a jet of charged particles that race out along the pulsar's rotation axis at about 70% of the speed of light. 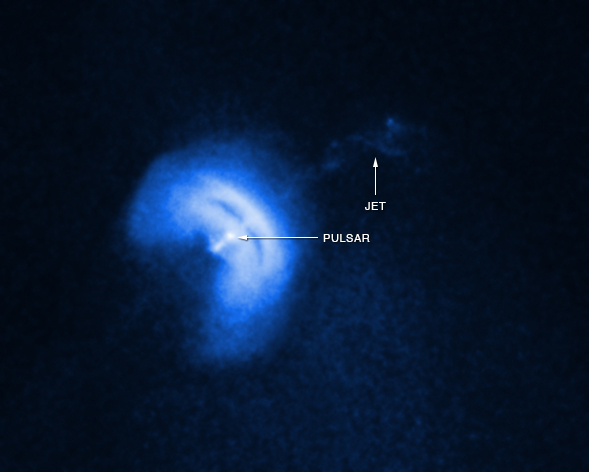 In this still image from the movie, the location of the pulsar and the 0.7-light-year-long jet are labeled. 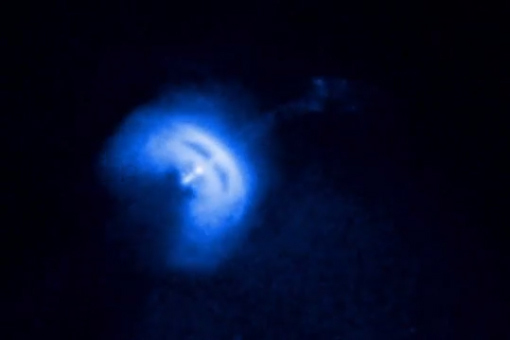 The Chandra data shown in the movie, containing 8 images obtained between June and September 2010, suggest that the pulsar may be slowly wobbling, or precessing, as it spins. The shape and the motion of the Vela jet look strikingly like a rotating helix, a shape that is naturally explained by precession, as shown in this animation. If the evidence for precession of the Vela pulsar is confirmed, it would be the first time that a jet from a neutron star has been found to be precessing in this way. One possible cause of precession for a spinning neutron star is that it has become slightly distorted and is no longer a perfect sphere. 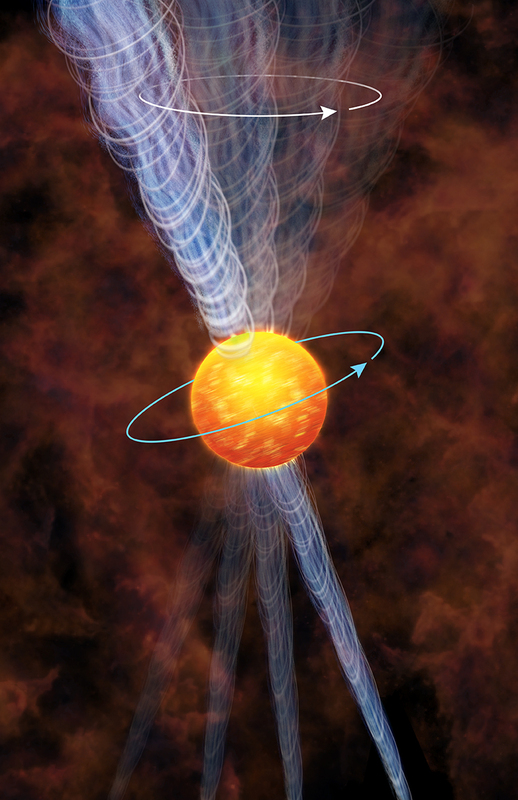 This distortion might be caused by the combined action of the fast rotation and "glitches", sudden increases of the pulsar's rotational speed due to the interaction of the superfluid core of the neutron star with its crust. The Earth also precesses as it spins, with a period of about 26,000 years. In the future Polaris will no longer be the "north star" and other stars will take its place. The period of the Vela precession is much shorter and is estimated to be about 120 days. 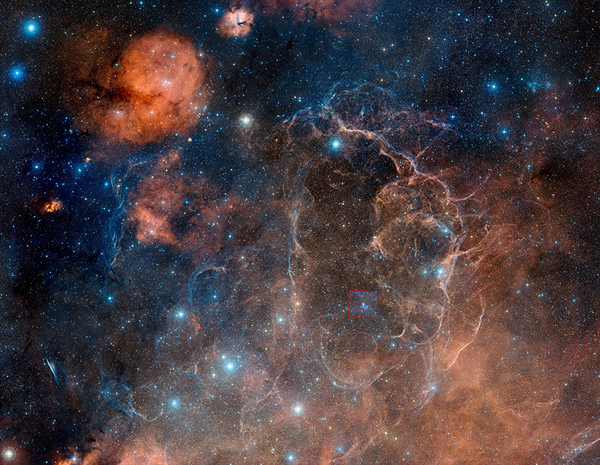 The supernova that formed the Vela pulsar exploded over 10,000 years ago. This optical image from the Anglo-Australian Observatory's UK Schmidt telescope shows the enormous apparent size of the supernova remnant formed by the explosion. The full size of the remnant is about eight degrees across, or about 16 times the angular size of the moon. The square near the center shows the Chandra image with a larger field-of-view than used for the movie, with the Vela pulsar in the middle. Coordinates (J2000) RA 08h 35m 20.60s | Dec -45° 10´ 35.00"
The picture is the same as a crab picture. I never thought before I will see the real neutron star "in action" with my eyes, and not on some "electromagnetic graph" or such. Thanks for the beautiful photos from Chandra X-ray Observatory. It is great to be informed about your activities and on the other hand, it is a pity to see and realize the status quo of the planet earth with political, economic, ethnic and religious chaos. The Jet makes a fine spiral. Isn't there something that is orbiting the Vela pulsar? Something like an iron core from a binary twin that did not have a chance to go supernova because of the explosion which takes all matter but the iron core? I am very fascinated with neutron stars, and this movie helps to feed my hunger for knowledge. thank you for the clarafications and explanations! This goes a long way towards satisfying my lay curiosity about physics and the universe. Astounding, what an experience, my students will be amazed when they see this movie and experience, thank you.